Right now in the United States, roughly 30 million surveillance cameras record a whopping 4 billion hours of footage every week. As technology evolves, so too does the capacity for spying. Congress just passed a bill on June 3, 2015, to scale back government access to citizens' phone records – a bill that was promptly signed by U.S. President Barack Obama. But on June 5, 2015, leaked Classified National Security revealed that, in the meantime, President Obama actually expanded the National Security Agency's surveillance. And if you think government spying is bad, check out espionage tactics of the Internet's biggest companies. "There is a public outcry today – as there should be – about NSA surveillance, but the breadth of that surveillance pales in comparison to the data that Google, Apple, Facebook, and legions of app developers are collecting," advancing technologies scholar and researcher Tarun Wadwha wrote in an April 15, 2014, article for Technologyreview.com. "Our smartphones track our movements and habits. Our web searches reveal our thoughts. With the wearable devices and medical sensors that are being connected to our smartphones, information about our physiology and health is also coming into the public domain." 1. You're Being Spied On by Stop Signs: According to a Huffington Post interview by Sara Schwartz with Money Crashers tech expert David Bakke, the Department of Homeland Security has spent millions of dollars on the installation of high-tech surveillance cameras capable of following you as you walk down the street. Schwartz notes a 2012 American Civil Liberties Union report that said the City of Chicago has access to more than 10,000 publicly and privately owned surveillance cameras. In the downtown district alone, nearly every segment of public walkways and common grounds are under video surveillance. In 2012, NPR also reported there was a growing trend of spending "hundreds of thousands of dollars" of city taxpayer money on surveillance cameras and software. Many of these ubiquitous cameras are in road signs and bridges that track our movements. The cameras can read and track license plates. "At a rate of thousands per minute, these readers capture and collect the license plate number, and the date, time, and location of every scan," reads the ACLU report. And these cameras don't always focus solely on cars. They also capture sidewalks and other periphery environments. Jay Stanley, Senior Policy Analyst at the ACLU, explained to The Huffington Post that police departments are now keeping unnecessary information on people who don't pose a threat. He also mentioned as the technology advances, the video feed will grow richer in quality. 2. You're Being Spied On by Your TV: Most people are used to having a camera in their phones and computers. Discovery News would like to remind us, however, that we all "willingly submit to algorithms on websites like Netflix and Pandora that recommend movies and music based on [our] viewing and listening habits." Now, computer chip giant Intel Corp. (Nasdaq: INTC) wants to install cameras in TVs. You see, the company is working on a web TV service with a built-in camera. The addition of the camera is "to personalize the user experience by making program suggestions based on viewing habits. As well, advertisers can expect to have their pockets lined by targeting ads to third parties," Discovery News reported on Jan. 9, 2014. Yes, the camera will be watching you. The new feature has a small failsafe, however. Eric Huggers, Intel Media's corporate vice president, told AllThingsD.com that he thinks viewers will get used to the device, but, if they don't, viewers can just pull a flap over the lens. 3. You're Being Spied On by Your Email: Two years ago, Startmail – a Yahoo! Inc. (Nasdaq: YHOO) rival – warned users against installing Yahoo's latest email platform. This means any message that Yahoo's algorithms find disturbing could flag a user as a bully, a threat, or worse. At the same time, Yahoo can now openly troll through email for personal information that it can share or hold onto indefinitely." That's right, if you have a Yahoo account, you're being monitored each time you compose and send a message. The same is true for Google Inc.'s (Nasdaq: GOOG, GOOGL) Gmail users. Private companies aren't the only ones reading your email — so is Uncle Sam. "The U.S. government… is either watching your online activity every minute of the day through automated methods and non-human eavesdropping techniques, or has the ability to dip in as and when it deems necessary – sometimes with a warrant, sometimes without.While servers such as Yahoo! and Google can legally scan your email for marketing purposes (because you agreed to let them), the government can only do the same as part of the Electronic Communications Privacy Act (ECPA), which requires the government to obtain a court order to obtain data. As you can imagine, this isn't hard for the government to do." 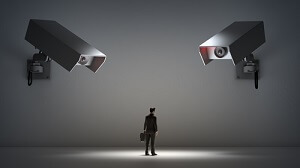 While former assistant secretary for policy at Homeland Security Stewart Baker told ZD.net that Big Brother can't just wander through your emails because it'd like to, if the government suspects criminal behavior, it can pretty much do whatever it pleases. 4. Your Text Messages Are Being Spied On: On Jan. 16, 2014, The Guardian revealed the NSA had been making extensive use of its text message database. "An agency presentation from 2011 – subtitled 'SMS Text Messages: A Goldmine to Exploit' – reveals the program collected an average of 194 million text messages a day in April of that year. In addition to storing the messages themselves, a further program known as 'Prefer' conducted automated analysis on the untargeted communications." More than 5 million missed-call alerts, for use in contact-chaining analysis (working out someone's social network from who they contact and when). Details of 1.6 million border crossings a day, from network roaming alerts. More than 110,000 names, from electronic business cards, which also included the ability to extract and save images. More than 800,000 financial transactions, either through text-to-text payments or linking credit cards to phone users. 5. You're Being Spied On by the Transit Authorities: When most people think of transit recording devices, they think of video cameras. But that's not the case in Montgomery County, Md. "The Maryland Transit Administration began audio recording… on some buses… and hopes to expand that to about half of the agency's 700 buses by summer," The Washington Post reported in October 2012. Cameras with both audio and video recording capabilities were mounted in each bus near the drivers. They roll nonstop, unlike some transit surveillance cameras that only record when activated. "They are recording at all times because a driver might not have time to activate it," Esther Bowring, a spokeswoman for Montgomery County, told The Washington Post. "If people are having normal conversations or talking on their phones, they're not going to be able to record that." Bowring also emphasized the "recordings are accessed only in the event of an accident or other incident, such as an attack on a driver or a complaint of driver misconduct." Don't forget the gossipy, nosy neighbors, as well. They are universal.